Switzerland 2016. DCP 16:9, colour, 74 min. 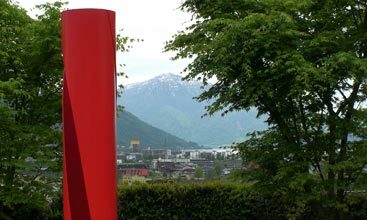 The internationally renowned artists Gottfried Honegger (1917-2016) and Kurt Sigrist (1943) are close friends of mine. I have known both of them personally for a long time. Their personalities differ tremendously, and yet there is something that unites both of them with me: their expression of imagery – the language of the image. I am interested in how they counterpose our time with their art. With Gottfried Honegger, the last representative of the ”Zurich Concrete”, the film focuses on creative seeing and geometry. 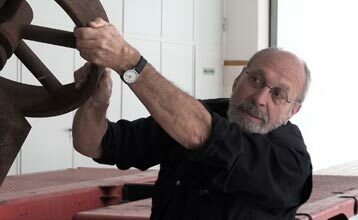 The artist Kurt Sigrist, whose genre is “object sculpture”, pushes boundaries. 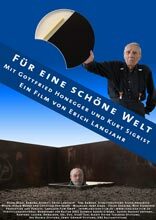 In his latest documentary, For a Beautiful World, Erich Langjahr portrays two of his close friends, internationally renowned artists, Gottfried Honegger and Kurt Sigrist. Though the personalities of the two artists are as different as night and day, Langjahr discovered one thing that connects them: their expression of and fascination with imagery. 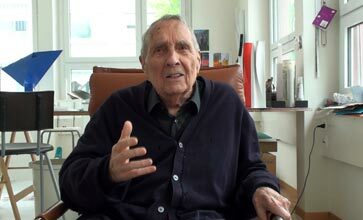 Gottfried Honegger, the last representative of the "Zurich Concrete", reflects on the importance of vision and perception, thinking about their effects on humans. He argues for a society that is more influenced by culture. Kurt Sigrist is concerned with the relation of spaces and places to the experience of interior and exterior, of insights and outlooks. Many properties, he states, are dominated by empty spaces that need to be filled with our experiences, thoughts, ideas and associations. Just as Honegger and Sigrist, Langjahr is also fascinated by imagery and its influence on mankind. He claims that his audience views the images on the screen and gives them meaning by connecting them to their personal experiences.